Today, CARP America chapter leaders gathered together with CARP Japan President Mr. Katsumichi Montoya and five CARP Japan Tokyo center leaders to share about activities during the past year. Japan, being much more experienced, had a lot to share, and America gratefully took in their presentations. America offered a fresh perspective. President Motoyama gave some opening remarks. First, each CARP chapter leader gave a personal introduction and shared about their CARP chapter. Then, there was a presentation by CARP America and CARP Japan on the basic activities each organization held during the first half of the year. The CARP Shibuya center leader presented on CARP Japan and spoke about the “International Borderless Conference” held at Waseda University with CARP Japan and CARP America just a few days ago. 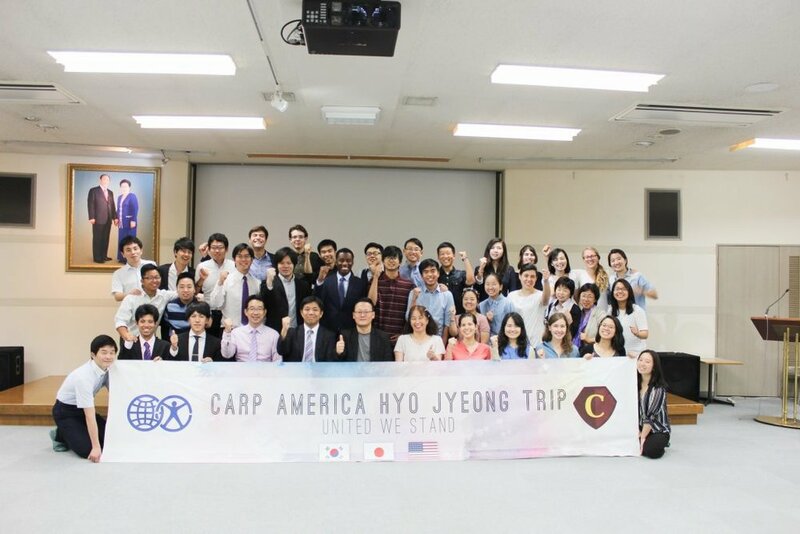 He explained that this was the first CARP event in 10 years to be held on a Japanese university campus and thanked the American students for helping to create momentum. Afterwards, participants from both sides asked questions about the presentations. Then, CARP Japan treated everyone to a wonderful sushi lunch. Following lunch, each chapter wrote down a 6-month goal and a 1-month goal to work towards until the end of the year. The meeting was short but very instrumental in learning about each other’s activities and understanding that we are all striving for the same goal and vision despite working with very different circumstances and cultures. It put us on the same team and gave us hope.